Free Shipping Included! SFP to SFP Fiber Media Converter - 2 x Standard Open SFP Slots - Supports Gigabit, Fast Ethernet and 2.5G SFP miniGBIC modules - Fiber to Fiber Converter - without Transceivers by ADnet at Andy Pemberton. MPN: AN-UM-2-SMC-AS. Hurry! Limited time offer. Offer valid only while supplies last. Do you have 2 segments of optical fiber network, that do not match in wavelenght or fiber cable type? Or, simply need to extend the distance? Do you have 2 segments of optical fiber network, that do not match in wavelenght or fiber cable type? Or, simply need to extend the distance? AN-UM-2-SMC-AS is Designed for All these purposes and even beyond them - Use Any Standard SFP Module You Have In Hand to Plug In A & B SFP slots and You Are Done - It Works! Changing Distance or Fiber Type? Again, Change SFP module , While Keeping Same Media Converter! Setup of these units are really easy if you follow 4 steps shown in gallery the above. Questions during installation? Not sure it will work with your setup? We are always here to answer You and guide You through! IMPORTANT! : While the unit supports all 3 of the most used tyoes of SFP modules (miniGBIC) - 155M, 1.25G, and 2.5G, use only the same (matching speed modules in Slots A and B at the same time. I.e configuration: Slot A - Gigabit SFP & Slot B Gigabit SFP is OK, but Slot A Fast Ethernet SFP - Slot B Gigabit SFP - will not work! USE IT as a Single Mode Dual Fiber to Single Mode Single Fiber Converter - thus, Saving The Fibers! 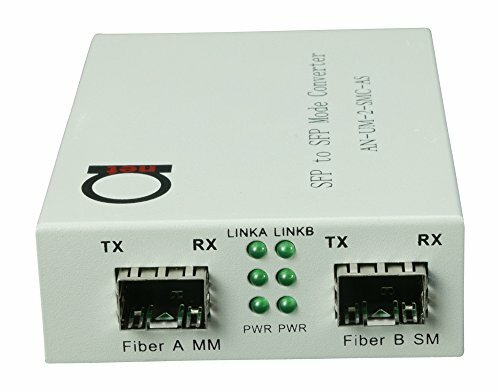 USE IT for Converting Wavelength when Interconnecting Network Devices - i.e. 850 nm to 1300/1310 nm, 1310 nm to 1550 nm and so on. Just find the correct and matching SFP's for both slots! SUPPORTS 1.25G (Gigabit Ethernet), 155M (Fast Ethernet) and even 2.5G SFP modules (Important: Use matching speed modules in Slots A and B only - i.e Gigabit + Gigabit only, do not mix).